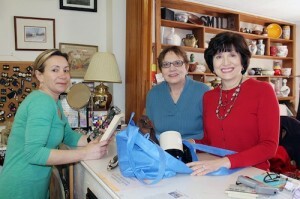 From left, customer Ana Norton and volunteers Nina Pellegrino and Theresa Radebaugh. 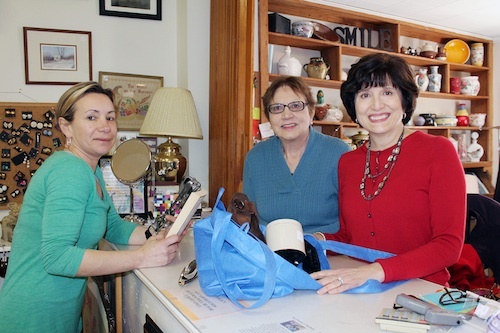 The Friends of Matheny’s Second Chance thrift shop passed the $100,000 sales mark on Thursday, April 3, the earliest date in the season that this point has ever been reached. The sale that put Second Chance over $100,000 was made a little after 10 a.m. to Ana Norton of Chester, NJ. The two Second Chance volunteers who made the sale were Theresa Radebaugh, also of Chester, and Nina Pellegrino of Bridgewater, NJ. All three received gift certificates for being the lucky buyers and sellers. Since its inception in 1983, The Friends of Matheny has raised more than $3 million to benefit the students and patients at Matheny. The Second Chance selling season doesn’t end until after Memorial Day, so the shop could be on pace for a record-setting season. This entry was posted in Uncategorized and tagged Friends of Matheny, Second Chance Thrift Shop. Bookmark the permalink. Powered by Wainscot Health Communications.